Spring is certainly cause for celebration. Sap’s running. Snow’s melted. Temperatures are rising. Crocus are up. 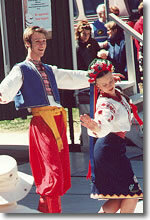 Folks who’ve endured a typical Canadian winter, are eager to participate in family-oriented outdoor spring events. 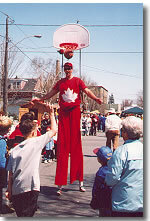 A real crowd pleaser, Perth’s Festival of the Maples, held yearly on the last Saturday in April, attracts 20,000 people. Perth, on the River Tay, in the heart of “maple syrup country” in Eastern Ontario, presents an ideal location to hold a festival. The town’s architecturally significant heritage area provides the proper back-drop for a salute to the stately maple. Maple syrup season begins with a “Tapping Out Party” that features the ceremonial tapping of the first tree and ends with Festival of the Maples begun nearly thirty years as a grand finale to the yearly sap run. With so much to do, the first order of your day should be to make your way to the local community centre for a pancake and syrup breakfast before heading downtown where the majority of festivities take place. Streets are closed for the day and the area is packed with booths, activities and entertainments which feature something for every member of the family. Street entertainments have included country and bluegrass bands, Scottish pipes and drums, steel bands, ethnic dancing, character actors, singers, choirs. Perth & District Chamber of Commerce can provide a complete list of the current year’s entertainments. Children aren’t forgotten. A special midway, old-time crafts and tasks, petting zoo and child-specific entertainments are set up just off Gore Street in the Tay Basin area for youngsters and the young at heart. 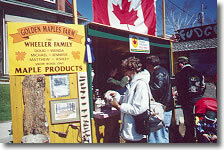 As the day is dedicated to the king of trees, and Canada’s symbol, the maple is well represented on the street where Lanark County producers set up informative displays that explain maple syrup production through the years, sell maple-related items - syrup, maple butter, fudge, toffee and compete for prestigious prizes in various maple product categories. One of the most unique festival events, “Empty Bowls”, takes place in front of Riverguild Fine Crafts on Gore Street. Soup, prepared by some of Perth’s finest restaurants, is served up in bowls that you can keep - for a fee. Five hundred bowls are donated by master potter Jackie Seaton. Proceeds from the soup sale are donated to programs run by Perth Food Bank and the Youth Centre. Festival of the Maples showcases community. Many local organizations get involved by operating food concessions, craft booths and hands-on displays. It’s worth the small admission fee to enjoy regional foods and wines that are showcased in the Crystal Palace in the Tay Basin area. 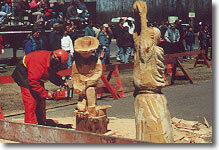 An antique & custom car show and chain saw sculpture are crowd pleasers. Perth Museum, housed in historic Matheson House, on Gore Street in the heart of the festivities , mounts demonstrations of pioneer cooking and crafts in an outdoor courtyard. Tired of walking? Hitch a ride on the horse-drawn trolley. While in the area, visit Wheelers Maple Heritage Museum, a half-hour north of Perth. The museum has one of the largest collections of maple syrup related artifacts in North America. Outdoor displays include a century old sugar shack, potash and boiling kettles. Say hello to “Turk” and “Lion”, a gregarious team of oxen. Wheelers tap 12,000 trees over 730 acres. Before you leave, have a feed of pancakes and syrup at the on-site Pancake House. Festival of the Maples is only one of Perth’s many yearly events that include, Fiddling & Step Dance competitions, Quilt Fest, Stewart Park Music Festival, Garlic Festival, Authors in the Park, Fall Fair, Pumpkinfest and a downtown Heritage Christmas event. As there is so much to see and do in the area, plan to stay for several days regardless of the time of year you visit. Check “A Wee Bit o’ Perth” on www.mestern.net for a more comprehensive overview and be sure to contact Perth & District Chamber of Commerce for an information package complete with list of events, times and places. Looking for a lovely, quiet place to stay? Located in the heritage district, Perth Manor Heritage Inn, called “Thuresson House”after it was built, is within walking distance of festival and main street areas. The c1878 mansion with its Georgian appearance and High-Victorian features such as, crested and palm windows, cast iron fireplace inserts and tapestry wall coverings, represents some of the finest architecture in Perth. One of the building’s most interesting features is an arts & crafts fireplace and surround with built-in book cases and whimsical heart decoration. A Victorian conservatory, off the dining room and ladies parlour, leads to grounds complete with fountains, statuary and a sunken English garden. Visit Perth, that wee bit o’ Scotland on the Tay, once and it’s guaranteed that you will indeed “come back again”.